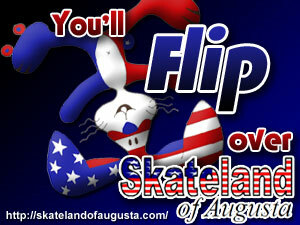 This 300×225 ad was designed in August 2009 for Skateland of Augusta, to be used on wrdw.com. The client sent the following hand-drawn image, and our internet salesperson suggested we flip the rabbit and use the phrase “You’ll flip over Skateland of Augusta”. I recolored the rabbit in Photoshop and applied some effects to make him appear 3D. A simple gradient in the background added depth to the image. Turnaround time on this project was three hours. That is a terrific ad! It should catch people’s attention. I later reworked the ad into a 728×90 leaderboard.